Indian police are warning that there are significant difficulties in recovering the body of John Allen Chau, the missionary killed last week by an isolated tribe at North Sentinel Island. Further details from Chau’s diary have meanwhile revealed that he was able to tell the Sentinelese people, believed to have lived in isolation for thousands of years, that Jesus loves them in one brief encounter preceding his killing. CNN reported that Indian authorities ventured near the island on Friday and Saturday, looking out for where Chau’s body was reported to have been seen by fishermen last week, but to no avail. "We have mapped the area with the help of these fishermen. We have not spotted the body yet but we roughly know the area where he is believed to be buried," said police official Dependra Pathak. 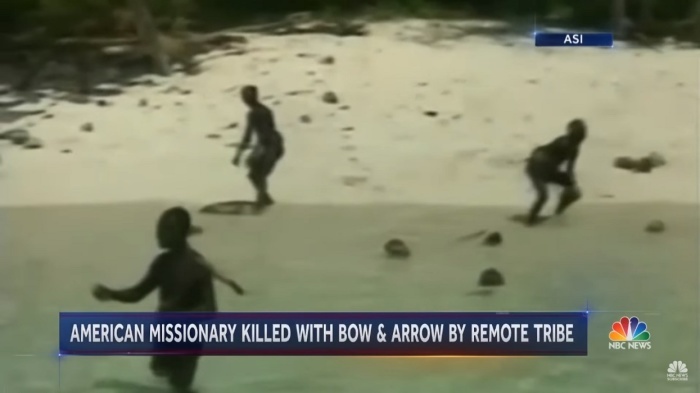 Pathak noted that his team saw a number of tribe members carrying bows and arrows, the weapons that are believed to have killed the 26-year-old missionary. "There are legal requirements as well which we need to keep in mind while carrying out the operation. We are also studying the 2006 case where two local fishermen were killed. The bodies were recovered then," he added. North Sentinel Island, which is part of India's Andaman and Nicobar Islands territory, has been protected for decades, with outsiders not allowed to venture anywhere near the area, for fear of exposing the tribespeople to modern diseases they have no immunity for. Chau's family, who have said that they forgive those who killed their son, shared excerpts from his diary last week with The Washington Post. The New York Times posted more details of Chau's attempts at contacting the tribe prior to his death, including one time where with the help of fishermen he was able to sneak past the Indian Coast Guard and get close to the island by kayak. “Two armed Sentinelese came rushing out yelling,” Chau wrote in his notes. “They had two arrows each, unstrung, until they got closer. I hollered, ‘My name is John, I love you and Jesus loves you.’"
Chau says that he was able to offer them some fish, but they kept coming toward him. “I turned and paddled like I never have in my life,” he recalled. As All Nations, an international Christian missions training and sending organization to which Chau belonged, revealed the 26-year-old is a graduate of Oral Roberts University who for years had trained to share the Gospel with the Sentinelese. International Executive Leader Mary Ho described the slain missionary as a "gracious and sensitive ambassador of Jesus Christ who wanted others to know of God’s great love for them."